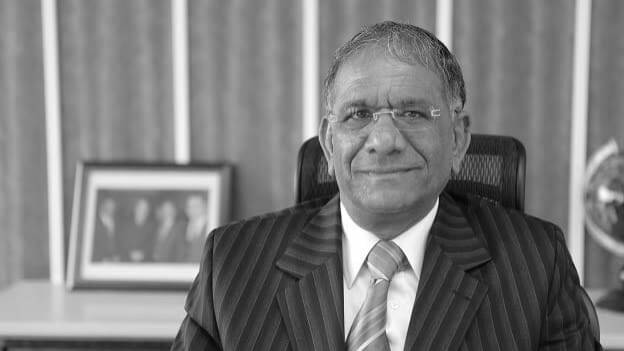 Govind Dholakia, who is the founder of Shree Ramkrishna Exports (SRK), a leading diamond cutting and polishing firm in Surat, talks about his personal philosophy and what has led to the creation of a billion-dollar empire in the diamond industry. Shri Govind Dholakia, the Founder and Chairman of Shree Ramkrishna Exports Pvt. Ltd. (SRK), talks exclusively with People Matters about his personal philosophy and the secrets to successfully building a billion-dollar diamond empire in the country. Here are the edited excerpts from the interview. Did you think that you would be this person who would reach this stature when you were a 13-year-old kid? When I was in seventh standard, my brother asked me if I wanted to enter into the business of diamond cutting and polishing, and before I could give exams of seventh standard, my brother brought me to Surat. I underwent a six months course in cutting and polishing diamonds. And after that, I worked for straight six years. My first salary was 103 rupees. At that point in time there were only 200 workers in the business of diamond cutting and polishing in Surat. In 1970, me along with my two partners set up our factory with only two workers. Then obviously I did not think we would make it this big, but all three of us had big dreams when we started. How was it for you when you came to Surat? My organization and my mantra is that ‘Problem is Progress’. When I came to Surat, I was happy that there was a roof above my head and was unlike the farmlands where we used to work in 42-degree temperature. Here in Surat factory, our day used to start at 6 am in the morning and got over at 8 pm in the night. I worked for 14 hours a day for six years of my life, but I worked tirelessly because I enjoyed what I did. Tell us about one thing that makes you feel very proud when you look back on your own life. It is not just one thing life, but many things which make me very proud. The best part is that the company to this day walks on the path of the philosophy with which it was conceptualized. The other thing that makes me very proud is my family. The second and the third generation are following on the same footsteps and they are successively doing better than us. Tell us about your philosophy. Sri Dongreji Maharaj was a Bhagvad Geeta narrator. I heard his narration in the year 1968. I liked his philosophy so much that it became the guiding principle of my life and also of my organization. The lesson that I learnt from him was about respect. He said that if you wish for respect, you must first respect the other person. He gave an example of the echoing mountains of the Himalayas. He said that if you go and shout, ‘May God bless you’, then your voice will echo back the same words. Similarly, in this world, if you give something to someone, they will surely return the same to you. When did that become your philosophy in practice? The next day when I went back to the factory, I started giving respect to people. As a consequence of my actions, the people around me also started to respect me. And in two months I gained the recognition of my boss. So, it became my personal philosophy before I started my own business. And this is how it has been for the last 47 years of my life. The same philosophy is followed by my huge team. When you give respect to the managers, the managers give respect to their teams. And this is how the culture of respect flows down the hierarchy. Anything that you would have done differently to get to this point? I have no regrets in life. There is no such feeling in me that things would have been different if I had done them differently. What has made your business successful? We have always focused on two things: Quality and Quantity. Quality is very important for us and we focus on it primarily. However, we also control the cost of production by ensuring that we create sufficient quantity. And the second thing, which is again a guiding principle derived from the talks of Shri Dongreji Maharaj, is ‘Wealth and Prosperity are earned through Hard work, and nobody should do anything unethical in order to earn them. An instance that shows how much we bring this into practice is about a rule which we brought in during 1995 restructuring of the company. The company was handed over to the second generation, and I told them that the diamond should be sold at the market rate. We can forgive if it gets sold at less than the market rate, but we won’t forgive if it is sold at a rate greater than that. In the end, we need to be conscious about the buyer. Once the customer leaves, he won’t come back. What are the qualities that you look at when you hire a new employee? We do not look at education so much as much as we look at the potential of the person. And the second thing that we look at is the attitude of the person. So, we primarily look at two things. How do you show appreciation for your workers? We let people know if they are doing good. We do it openly during the programs and functions. If their attitude is good, we tell them. And if their performance is good, we tell them. How do you let go of a difficult employee? We try to find the source of the problem. Then we identify someone, who that difficult teammate of ours would listen to. In case that fails, we talk to him and try and make him understand. And, in case if that also does not work out, we simply let him go. Any message that you would want to give to young leaders? All I would want to tell them is that all people are capable of doing good for themselves. Nobody can do bad towards them or good for them. So, have a lot of self-belief and involve yourself in work. Also, gain experiences if you want to be successful.